It doesn’t matter whether you often entertain guests in your home or you just want to have a nice spot to chill after a stressful day outside because a home bar is a great idea nonetheless. Here are some great ideas to get you started and inspire you to create your very own bar at home. Bar carts are awesome because they are small, mobile and can be very convenient especially if you don’t have much space for a full-fledged bar in your home. This stylish bar cart has mirrored accents that look chic and you don’t even have to put much decoration on it as the bottles on it are trendy enough. Another great way to save space for your home bar is to have it built-in into your walls, like this gorgeous example here. This cabinet is different from the usual boxy ones you see as it has a rather interesting outlook with its curvy lines that make it look like a wall sculpture. For a more luxurious touch, go for the home bar counter so you can be sure that you will never run out of drinks as they have so much space for you. Try out a retro looking one like this that brings a more Art Deco flair to your home. If you have a home bar counter and want to make it look more unique then you can go for a feature wall accent. This has the added bonus of helping you save time on using accessories to decorate the home bar and you can use just a few simple ones like this gold mirror and pendant lamp for an elegant look. 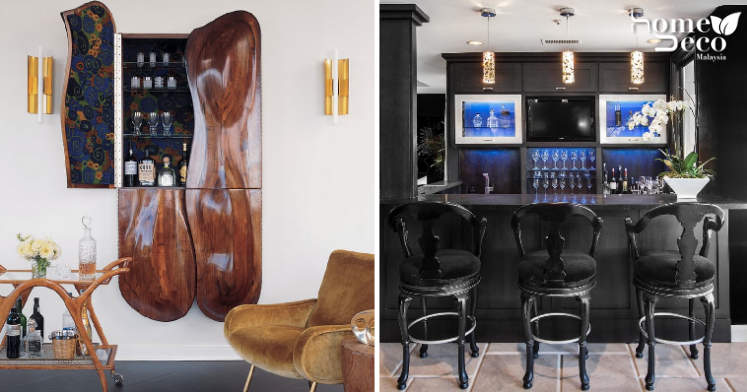 This home bar is a really striking one that will grab the attention of your guests because they probably have never seen something like that. Utilising a mix of Moroccan and Gothic styles, this home bar turned out to be really extraordinary and makes a great socialising space. For those of you who prefer a more contemporary and sleek look, then this bar is perfect for you as it is dramatic and classy at the same time. The blue lighting, intricate chairs and pretty pendant lamps help to brighten up the black palette for a very timeless look.